Advantech’s UNO-2000 series of fanless highly ruggedized Embedded Automation Computers include an embedded operating system (Windows CE, Windows XPE, WE37, WE38, Linux-Embedded). They also include Advantech iDoor technology wihich supports automation feature extensions such as industry fieldbus communication, Wi-Fi/3G, digital I/O, including Palm, Small, and Regular-size form-factors. UNO real-time Ethernet modules are equipped with daisy chain capabilities making it the easiest way to add more controllers into an existing network. The PowerGate 66 IP66 / NEMA 4 variable frequency drive (VFD) is Mitsubishi’s introduction to the decentralized drive market. The stand-alone VFD is an engineered solution incorporating a version of the Mitsubishi Electric E700 VFD into a custom made NEMA 4 (water resistant) enclosure allowing the drive to be placed closer to the motor even in harsh environments. The PowerGate 66 drive is especially suitable for applications that require precise motor speed control, including conveyors used in food and beverage operations and material handling, and the control of pumps and fans in HVAC and water handling applications, or in any application where the drive is exposed to water and dust. Mitsubishi Electric Automation family of automation products including programmable logic controllers, variable frequency drives, operator interfaces, motion control systems and servo amplifiers and motors. The GOT1000 Series of Graphical Operator Terminals is an all new high performance line of panel mounted and pendant style touch screen displays. Models in this family combine high resolution TFT (Thin Film Transistor) and STN (Super Twist Nematic) displays with a wide assortment of sizes and resolution to cover 5.7 inch QVGA to 15 inch XGA terminals. Terminals support a wide range of connection types and vendors. GOT1000 terminals are configured with a single easy to use programming environment. Eliminate Gateway PCs and Minimize Integration Effort! Mitsubishi Electric Automation’s MES Interface and MES Interface IT technologies offer tremendous cost savings by allowing shop floor controllers, such as iQ Automation, to communicate directly with enterprise IT level servers and mainframes. This avoids the need for intermediate PC-based hardware and its associated reliability, cost and maintenance issues. MES Interface goes beyond just eliminating excess hardware; through MES Interface’s low-cost, direct channel to IT systems, manufacturers gain a valuable window into their processes, resulting in higher efficiency, reduced waste, better quality and ultimately, an improved bottom line. Advantech’s Factory & Machine Automation target production automation, packaging automation, logistics & warehousing that require a compact, reliable, and robust network system. Advantech helps customers to achieve high scale volume production goals and raise their market competitiveness. The newly released FX3S adds extra expandability making it possible to utilize analog, Ethernet and MODBUS® functions even in small-scale systems. The FX3S is the fit-and-forget PLC solution for space and cost conscious applications requiring up to 30 I/O. This minimum-expandability, battery-less maintenance free controller is perfect for handling straightforward processes and can be hidden away in locations without regular maintenance activities. Mitsubishi Electric Automation, Inc. offers a family of automation products including programmable logic controllers, variable frequency drives, operator interfaces, motion control systems, servo systems and robotic solutions. Equipped with the EtherNet/IP and PROFINET protocol, the ADAM-6100 series also allows daisy chain connections, making it possible to transfer data much faster during process control and other industrial automation applications. Daisy chains also provide a more scalable system and using fewer wires helps avoid interference common in factory settings. 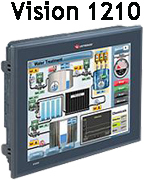 The Vision 1210 Controller from Unitronics is a perfect fit for the food industry- with its IP66 rating, this unit is ideal wherever spray/wipe down applications apply. A wide variety of on board I/O options can be added by simply snapping a module onto the back of the PLC.